Our ability to successfully join a log wall system to a post has become one of our proudest achievements. 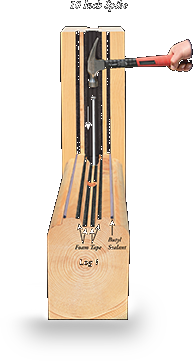 Our KeySpline® system increases design possibilities of our log homes. 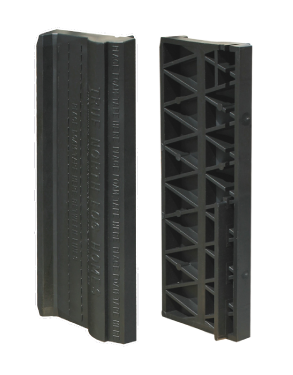 It allows us to offer square post corners or create any angled log walls with our PentaPost®—meaning we create turrets and prow fronts easily. A post slide is factory installed in the channel of the post. We apply four rows of foam tape vertically on the post from top to bottom. Log 1 is installed against the post (brown arrow). A specially designed foam pad is inserted into the post slide in the post and hole of log 1. We apply two rows of foam tape to each half of the KeySpline®. The first half KeySpline® A with a lower tab is inserted into the post slide in the post. The second half KeySpline® B with the upper tab is inserted into the post slide above KeySpline® A. 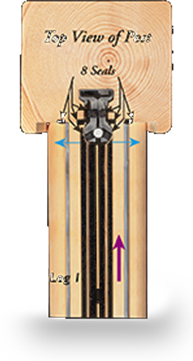 The half KeySplines® slide together (orange arrows) and interlock to form one complete KeySpline® C.
KeySpline® C and the foam pad are pushed down (yellow arrow) along the post slide in the post and the hole of log 1. The foam pad completely seals between each KeySpline®. A 10” spike is driven into the top end of the KeySpline® (white arrow). The spike separates the two halves of the KeySpline® in the hole of log 1 (blue arrows). This secures and pulls log 1 tight (purple arrow) forming eight seals while still permitting the logs to settle against the post. Once the four rows of foam tape and two rows of butyl tape are applied to the top of log 1, log 2 is installed (green arrow) and the sequence continues. The KeySpline® pulls the logs tight against the post forming six seals (blue). The logs slide down in the post slide to accommodate log wall settlement (green). A bay window wall configuration permits unique room design features (i.e. breakfast nooks, hot tub rooms, or turrets). 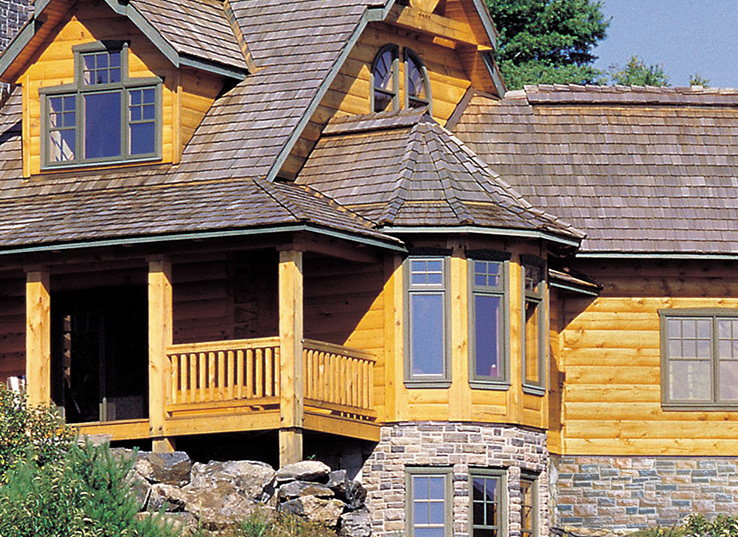 Overcoming the aesthetic and structural issues when the log home design requires angled corner applications. Typically, angled corner applications are stick-framed then clad with siding, compromising the structural integrity and aesthetics. Nails used to attach siding can rust and deteriorate. Log walls settle, whereas stick frame walls do not. This leads to air infiltration. 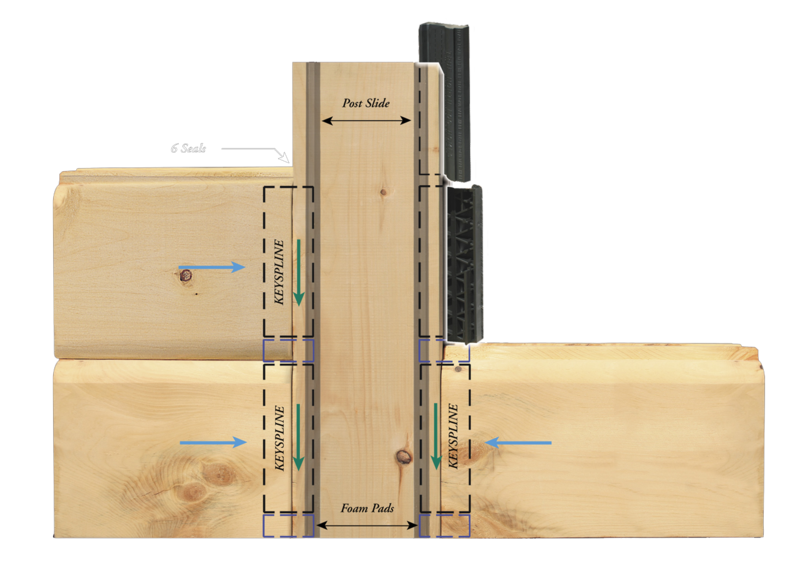 Our exclusive KeySpline® and post slide technology provide an air tight seal between a post and a log wall while accommodating all log wall settlement. 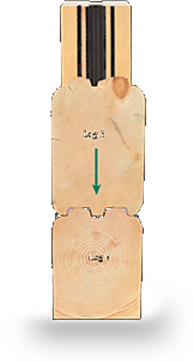 Our square and PentaPosts® permit every log wall angle imaginable.